My wife and I recently went to one of my favorite restaurants in Chicago -- the Atwood Cafe at the Hotel Burnham. When I teach online community classes, I always take the trainees to this restaurant. You can pick any entree and not go wrong, however, the graham-cracker-fried calamari is an absolute must. As we sat down, the waitress asked if we wanted drinks. I asked if they had cachaça. No? I settled for a seven-and-seven, an old Gomes family mainstay. When the dessert menu came, I noticed they indeed had cachaça! I pointed it out to the waitress, who graciously kept it off the bill -- my reward for catching a minor lapse in menu-memory. 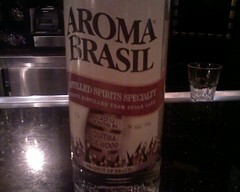 There in my hand was a couple of ounces of crystal clear cachaça from a label I had never heard of: Aroma Brasil. Let's just say that the free cachaça wasn't the only pleasant surprise. Over on Twitter, Mixology's Helmut Adam once lamented that cachaça makers did not take full advantage of the wide variety of woods available in Brasil. ("Getting tired of the taste of used bourbon oak.") Not so here. Aroma Brasil offers cachaça aged in either bálsamo or jequitibá rosa -- both native woods. I tasted the latter. This white lightly tinted cachaça, I was told after contacting its former importer a week later, was so good and so smooth that bartenders actually couldn't bear to make caipirinhas with it. Caipirinhas, of course, mean volume and there just aren't that many of us cachaça-sippers up there in the states. Tasting it, I believed it. Making an Aroma Brasil caipirinha certainly wouldn't be the gross affront that, say, a Single-Barrel-Jack-Daniels-And-Coke would be, but close. I often disagree with folks who refer to cachaça as a "sugar-cane brandy", but this is right up there with the most elegant sipping spirits I've had. Right now, distribution is severely limited. 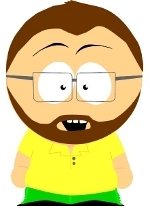 The first importer managed to get it into various places in Florida and... Skokie, Illinois. This wonderful find was last seen in the stateside care of Jose Silva, general manager of Peninsula Beverages. And, thus, I'm proud to deliver unto my readers Cachaçagora's first five-barrel-rated cachaça. I will have to look for this brand now, thanks! I agree, the different woods are a refreshing change from oak. Thanks as always for stopping by. Always a pleasure. Good luck finding either variety of Aroma Brasil. It's been in the hands of two distributors this year. I did hear something about possible availability in Germany. As of right now, it's available in one restaurant in Chicago, a liquor store in Skokie, and various places in Florida. Haven't contacted the Beleza Pura folks yet, but I might have to. Interesting about food regulations and wood. I do know that some woodworkers are discouraged from working on certain woods except in the most highly controlled conditions, for fear of the particular effects of the dust. Boca Loca and Cabana are also aged in jequitibá barrels.